Many conservationists assert that turtles are the most endangered vertebrates on the planet. 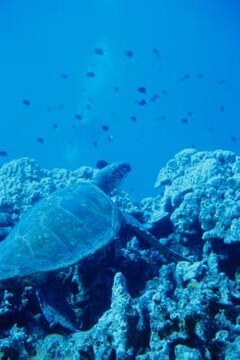 Because of unregulated harvesting, habitat destruction and some commercial fishing practices, almost one-quarter of the world's turtle species are in peril, according to the International Union for Conservation of Nature. Conservationists and scientists use statistics to understand the current population levels, as well as quantify the effects produced by conservation efforts. The reproductive strategies of turtles differ from species to species -- some produce large numbers of young, each with little chance of surviving to adulthood, while others produce a few offspring that have a relatively high chance of surviving to adulthood. Sea turtles primarily exhibit the first strategy -- scientists estimate that only one in 1,000 sea turtle eggs survive to adulthood. By contrast, other species, such as the critically endangered radiated tortoise (Geochelone radiata) produce less than 10 offspring, but the offspring are more likely to survive to adulthood. Different types of turtles also mature at different rates, which affects the rate at which a species can replenish individuals that are lost to predation or poaching. For example, Galapagos tortoises may require a quarter or half century to mature, while a hawksbill turtle may only require three or four years to mature. By understanding the reproductive strategy and maturation rate of different turtle species, scientists and conservationists can tailor protections to best support protected species. The IUCN Red List categorizes 44 living turtle species as endangered, and an additional 32 species as critically endangered. In the United States alone, 14 species -- 25 percent of the country’s native species -- receive protection under the Endangered Species Act. Sometimes, protection does not come soon enough; of the 15 subspecies of Galapagos tortoise originally documented, only 11 are still alive. While researchers cannot be sure of exactly how many turtles poachers kill annually, they are able to deduce regional estimates by considering several different lines of evidence. Scientists estimate that poachers kill over 30,000 green sea turtles annually in Baja, California. In Southeast Asia, where many locals consider turtle flesh and eggs to be an aphrodisiac, researchers suspect that sea turtle harvesting removes 50,000 animals from the wild each year. In 2007, authorities intercepted a Chinese fishing vessel in the waters off the coast of Indonesia; this single ship contained 397 dead sea turtles. Unfortunately, conservationists have never been able to declare victory and rescind a species’ protected status, once it's listed as a protected species. Despite this, conservationists are working hard to prevent turtles from being illegally poached, reduce commercial by-catch, protect egg nests and use captive breeding programs to bolster wild populations. In a little over 10 years, the New York Zoological Society was able to produce approximately 200 radiated tortoises at their breeding facility. The Sanibel-Captiva Conservation Foundation has tracked sea turtle nesting statistics since 1992; in 2012, the conservationists recorded the successful hatching of over 9,000 sea turtles. The year before was even more productive, as more than 15,000 hatchlings successfully reached the water in 2011. Bota Kanan is a Malaysian conservation facility that specializes in turtles. Since beginning their conservation work in 1975, Bota Kanan has released approximately 40,000 young turtles into the wild.